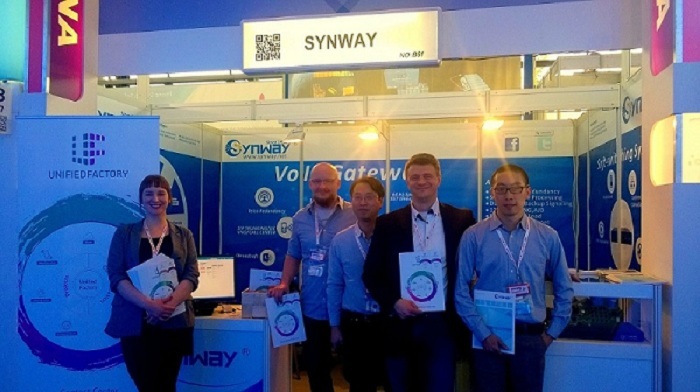 March 20th, Hannover---Synway, one of the world’s leading IP communications services providers, attended CeBIT 2015 with its latest designed VoIP products and solutions. Themed as d!conomy, the exhibition attracted 3,300 exhibitors from 70 nations, leading visitors into virtual worlds to experience everything from a breathtaking ride on a rollercoaster to controlling a brewing process. This time, Synway was honored to present the current and potential customers the newest VoIP solutions with our partner Unified Factory. At the site, what caught coming visitors eye and won the most acclaim were the 480ch high capacity VoIP card and the groundbreaking gateway lineup. The gateway can support up to 16E1. It is suitable for SMBs, VoIP service providers and System integrators for smooth migration to the new-age IP telephony, helping them to control the communication overheads and realize an earlier return on investment through advanced features and functionalities. “Synway dedicates to constant technology innovation, enabling to provide more value-added services and solutions for customers. We will always think what customers think and keep their needs as our top priority.” said Simon, marketing director of Synway. Unified Factory, a company with 20 years of marketing awareness and the devotion to creates solutions covering areas in sales,e-commerce, communication, client service etc., is the proven partner who delivers great possibilities for integration with various systems and applications. With its go-to-market approach, it is determined to bring harmony to your business and makes it simpler, faster, and safer.